Choose between our Mutley 25 inch dog leash - great for larger dogs and the Mutly 40 inch - giving your pooch more freedom while reducing the pull hazard of traditional dog leashes. The Mutley leash is as versatile as leashes come. Made to be durable and practical, the Mutley dog lead is the best dog leash for an active lifestyle. 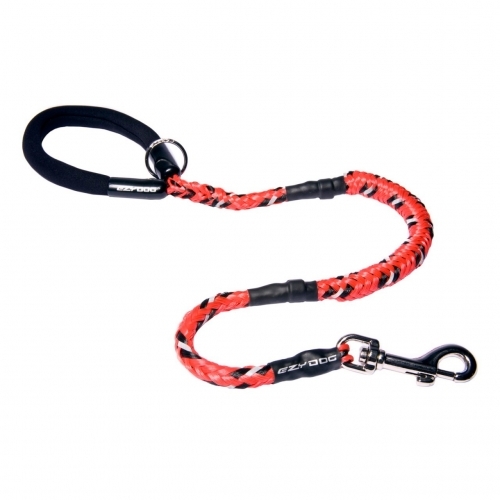 The shock absorbing section allows your dog the freedom to jump and tug at the leash without hurting himself and also spares you from having to wrench your hand if your pet decides to make a run for it. The variety of other features that make this dog leash so versatile are what give you the confidence to go out and have fun with your dog anywhere at any time. You know the Mutley leash will be up to the challenge. Don't forget to pair your wonderful new dog lead with a unique dog collar or a sturdy dog harness vest from EzyDog! Night or Day, Rain or Shine, Let the Best Dog Leash Take You There! Any time is the perfect time to go play with your dog using the Mutley dog lead. You can venture out into the night without worrying; the reflective tracers in the leash will help make you visible in the headlights of passing cars. And you never have to take a rain check when you have the waterproof features of the Mutley leash.